In February, winter still holds sway over much of North America. But in Argentina, it’s summer, and birds are in full voice. Argentina’s national bird, the Rufous Hornero, belts out a rapid trill while the Rufous-bellied Thrush sings its lovely song. 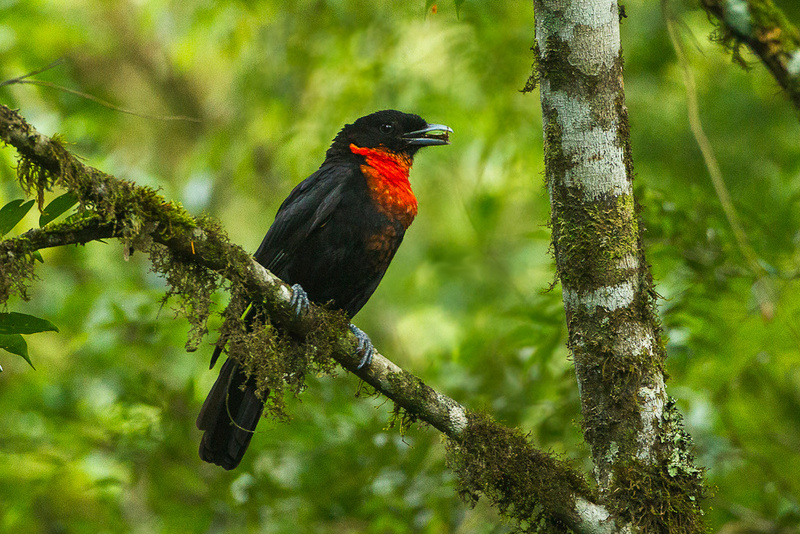 In the tropical forests of northeastern Argentina, a male Red-ruffed Fruitcrow, like the one pictured here, booms out its display calls. And the cheerful, bubbly notes of an Ultramarine Grosbeak remind us that spring in North America — and the arrival of birds like the Rose-breasted Grosbeak — isn’t too far off. Today, winter still holds sway over much of North America. Trees are bare. Spring wildflowers and the songs of most birds are still months away. But well south of the equator in Argentina, it’s summer, and birds are in full voice. [Rufous Hornero song, http://macaulaylibrary.org/audio/143589] Argentina’s national bird, the Rufous Hornero, belts out a rapid trill. It's a rusty brown bird the size of a towhee. From the woods nearby, a lovely song breaks forth. [Rufous-bellied Thrush, http://macaulaylibrary.org/audio/133282] It’s a Rufous-bellied Thrush, a near look-alike of our robin. In northeastern Argentina, a strange sound echoes through the mountain forest. [Red-ruffed Fruitcrow, http://macaulaylibrary.org/audio/62811] A male Red-ruffed Fruitcrow, booming out its display calls. Although black and crow sized with a gleaming red chest, the fruitcrow is no kin to our crows, but a cousin of South American bellbirds. Bird sounds provided by The Macaulay Library of Natural Sounds at the Cornell Lab of Ornithology, Ithaca, New York. Rufous Hornero  recorded by Krzysztof Zyskowski; Rufous-bellied Thrush  recorded by Michael J Andersen; Red-ruffed Fruitcrow  recorded by Paul A Schwartz; Ultramarine Grosbeak  recorded by Paul A Schwartz; Rose-breasted Grosbeak recorded by Curtis A Marantz BirdNote's theme music was composed and played by Nancy Rumbel and John Kessler.